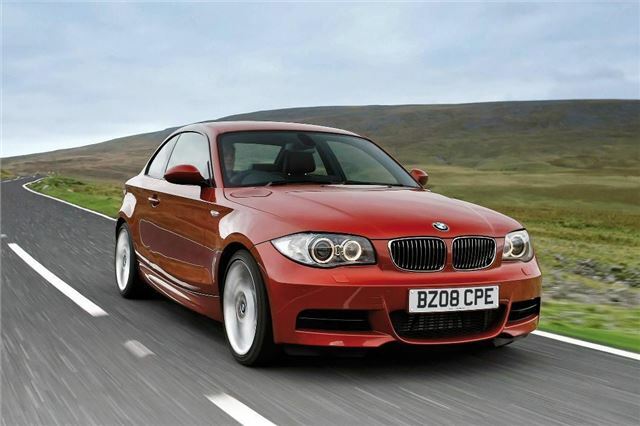 Good looking sporty alternative to the standard 1 Series, super quick 135i, strong and efficient diesels. Tight in the back for taller passengers. How does 306PS in a 4-seat coupe the size of a Golf grab you? And not any old 306PS engine, but ‘engine of the year': BMW's sensational twin-turbo 3.0 litre straight six that's both benignly tractable and very, very fast. Over the last year BMW has been turning its slow selling sow's ear of a 1-Series into something of a silk purse. First we saw the three-door hatchback version with it's Efficient Dynamics 118 diesel that has since been developed to limbo under the 120g/m CO2 limit that gets it into London for nothing from next February and cuts the annual tax bill to £35. I look forward to driving it every time because of its classic look, perfect driving position and responsiveness.